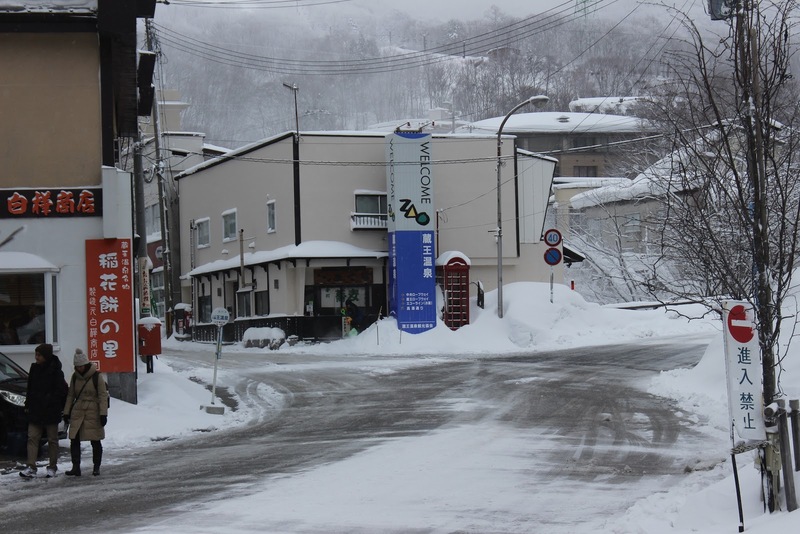 Today we are heading back to Tokyo from Zao Onsen to do some headphone shopping and karaoke! We stayed at the Ryokan (traditional Japanese inn) Matukaneya last night and upon waking we enjoyed another dip in the ryokan's onsen before feasting on breakfast. 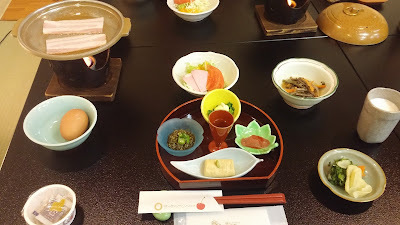 The food was a mix of Japanese vegetables and seafood, as well some more western fare such as bacon and eggs which we fried up on a candle powered hot plate. After checking out, we were dropped off by the hotels courtesy bus at the Zao onsen bus terminal. We then caught the next bus to Yamagata station which cost 1000 yen and took forty minutes. Although we had caught a local line train from Sendai yesterday, Yamagata is actually a major station on the Yamagata Shinkansen line. This line is one of the mini shinkansen lines with the trains on it running on existing tracks at a reduced speed compared to the main line shinkansen. It was still pretty fast and once we reached Fukushima our train attached itself to one of the main Yamabiko trains and we reached Tokyo after a total journey time of around two and a half hours. However, by the time we got back into to Tokyo, stored our luggage at our hotel (Toyoko Inn Tokyo Kanda Akihabara), it was time to eat again. We decided to go to Otoya which offers a large variety of Japanese style set meals and is one of our favourite chains in Japan. 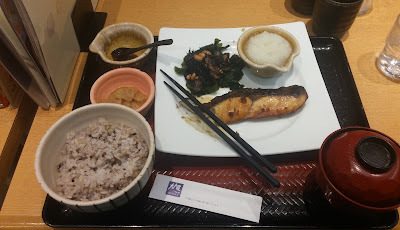 Kate got fried fish and I had some gyuutan which was very nice although not as good as the gyuutan we had enjoyed in the dish's hometown Sendai. Kate ordered some dessert which was some sort of red bean and green tea sunday, and it was apparently the best desert she has ever eaten. For my part I had some Japanese pudding (purin) which was also extremely delicious. After Otoya I did some shopping. What I was looking for was some headphones to use for my computer as I basically didn't have anything at the moment beyond earbuds. 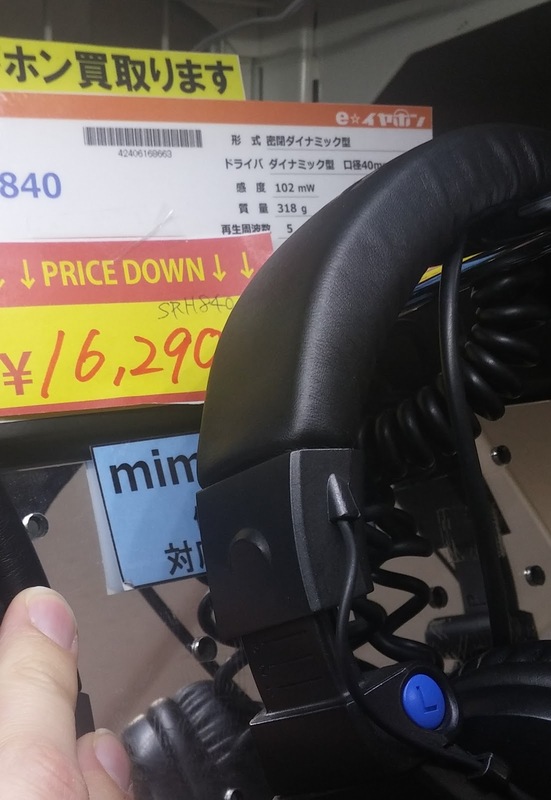 The great thing about headphone shopping in Tokyo is you can find a huge selection and each model has a demo pair you can plug into your own device (e.g. phone) to test the sound! I mainly looked at Yodobashi which is a huge electronic chain, and the headphone specialist store E-earphone in Akihabara. The huge range can actually make choosing a bit difficult to be honest, but after lots of testing I ended up buying a pair of Shure SRH840 headphones. The prices were already cheaper than what I could get in Australia (even using an online offshore website), and I was able to additionally get them tax free and with a 5% discount for paying with Visa due to a visa promotion. All up I saved about $60, which was great. I'm still using these headphones now and they perform really well, my only slight complaint is that they are a bit heavy. Along with my Shure SRH840 purchase I also picked up some audio-technica ear buds which cost only 1000 yen each, but sound really good; comparable to many mid to high end ear buds. Once evening hit it was time for some karaoke! We went to the Big Echo in Akihabara near the station and ended up with a room that had a great view out over the train line. Another plus was we got an electronic ordering tablet for the first time which meant we could order food and drinks for the room without having to ring up on the phone. This is a huge plus it’s always difficult talking on the karaoke phones, especially in Japanese. As it was Saturday night in the middle of Akihabara we probably payed the highest hourly rate in all of Japan for karaoke which meant, with the addition of a few alcoholic drinks each our bill came to around 8000 yen for two hours. This was much much higher than usual, but still- really not that bad! Tomorrow we'll be travelling to Chiba to do some indoor go karting!